A’DAM LOOKOUT is an observation deck with an unrivalled panoramic view of Amsterdam. You’ll see the city’s historical centre, its pulsating port, the unique Dutch polder landscape and you’ll spot the famous canals which belong to the UNESCO world heritage list. Complementing the experience is a state-of-the-art interactive exhibition about Amsterdam’s history and culture. A’DAM LOOKOUT is located on top of the A’DAM Tower in Amsterdam North. ‘Over the Edge’ is Europe’s highest swing on our sky deck. 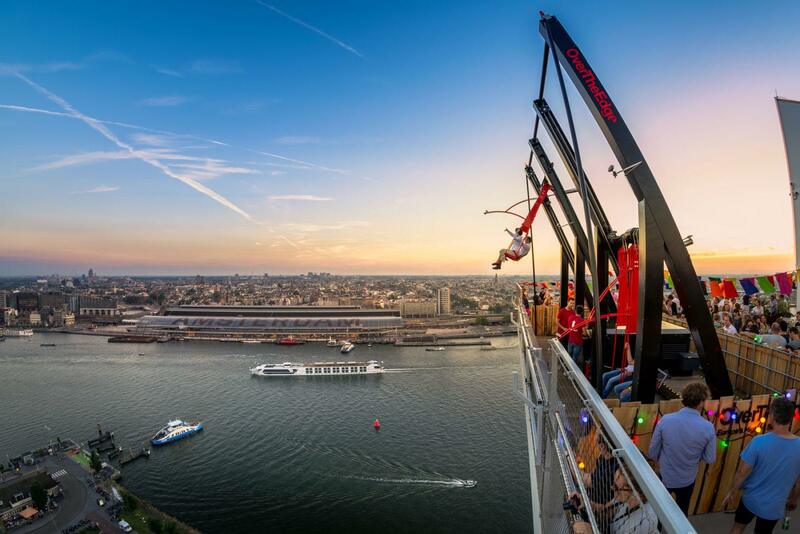 Daredevils and thrill seekers will swing 100 meters above the ground, back and forth over the edge of the tower with Amsterdam below their feet. Enjoy the unrivalled view over our capital city, while the adrenaline flows through your body.